There were no billion-euro deals in 2017 and the beginning of the year in particular, in terms of deal value, was not as high as in 2016. This could be explained by the delayed effects of the Brexit referendum in the United Kingdom and the US presidential election, which added slightly to uncertainty within the Netherlands. The second half of the year was better and the fact that the Dutch market is becoming more and more seller-friendly has restored shareholder activity in the corporate landscape. In two important deals in 2017, AkzoNobel and Qualcomm, US-based hedge fund Elliott played an important lead role. Most M&A transactions in 2017 were within the service industries and manufacturing3 but the number of specific (information) technology transactions continues to increase. A new development in 2017 was the multiple initial coin offerings that followed the cryptocurrency mania and created an interesting new form of financing. Dutch transactions are generally structured by the transfer of shares or (specific) assets of the company or by way of a legal merger. The main principles governing the legal framework of these transactions are laid down in the Dutch Civil Code. Under Dutch law, the stakeholder model is used most often, whereby the board of a company has a duty to act in the best interests of the company and all the stakeholders involved, thereby focusing on creating long-term value. The Enterprise Chamber, a specialised entity within the Amsterdam Court of Appeal, is the court of first instance in disputes involving mismanagement and similar corporate issues, and the appellate court in certain corporate litigation disputes. The Enterprise Chamber is often addressed by foreign stakeholders to challenge the parameters of the Dutch stakeholder model, for instance in a recent case in which shareholders Elliott wanted to intervene in the strategy of AkzoNobel in order to enter into negotiations with PPG Industries for the acquisition of AkzoNobel. In the pre-contractual phase, parties are obligated to behave in accordance with the requirements of reasonableness and fairness and, in doing so, they must also have their behaviour determined by the legitimate interests of the other parties. Although in theory all parties are free to break off negotiations, it can be unacceptable to do so because one party may have the expectation that an agreement has been or will be concluded. In that event, that party could be entitled to compensation, or could request an injunction requiring the other party to continue negotiations. What the parties could reasonably have expected in a particular set of circumstances should be taken into account to determine whether or not such a situation has arisen. In the event that a shareholder requests an agenda item that may lead to a change in the company's strategy (such as a takeover), the management board can invoke, pursuant to the Corporate Governance Code, a response time of a maximum of 180 days for further deliberation and constructive consultation. Furthermore, it is possible to place preference shares at a different entity, such as a foundation that is serving the interests of the company and its stakeholders. By giving this entity a call option that can be exercised during an imminent takeover, the equity interest that a hostile party accrues will dilute and the other entity can make sure the company focuses on creating long-term value. It is also possible to issue priority shares with specific (voting) rights or depositary receipts instead of shares, in which event the votes on the shares will stay with a foundation that is friendly to the board of the company. Before concluding an M&A transaction in the Netherlands, it may be required that the works councils of the parties involved are notified and consulted (pursuant to the Works Council Act) and that a notification is sent to the SER Merger Code Committee and the trade unions in question (pursuant to the SER Merger Code 2015). Obtaining clearance from the Netherlands Authority for Consumers and Markets and the European Committee regarding possible competition concerns may also be required. Furthermore, sector specific notifications may be necessary, such as to the Dutch Central Bank. EU Member States were required to be compliant by 26 June 2017 with the Fourth Anti-Money Laundering Directive (EU) 2015/849 (AMLD IV), which seeks to prevent the use of financial systems for money laundering or terrorist financing by means of, among other things, introducing an Ultimate Beneficial Ownership Register (UBO Register). The Netherlands has not met this deadline. The draft proposal act introducing the UBO Register in the Netherlands was published for consultation on 31 March 2017. It was intended to send the draft proposal act to the House of Representatives in the first half of 2018. However, on 19 April 2018, the European Parliament approved the Fifth Anti-Money Laundering Directive (AMLD V), amending AMLD IV and giving Member States another 18 months to implement the UBO Register in national law after adoption by the European Council. For this reason and because of the fact that AMLD V has consequences for the contents of the draft proposal act (e.g., it is required that the UBO Register will be publicly accessible), the Dutch Minister of Finance has put the national legislative process on hold. The amended concept proposal act introducing the UBO Register will now be presented to the House of Representatives early in 2019. A legislative proposal for the management and supervision of legal entities was submitted to the House of Representatives on 13 June 2016. The proposal aims to clarify the legal framework that is applicable to the association, the cooperative association, the mutual insurance association and the foundation. The most important change is that provisions applicable to the public limited company and the private limited company on certain items are now applicable to all legal entities. The proposal stipulates that directors and supervisors of all legal entities must put the interests of the legal entity first. It is also a requirement for all legal entities that directors and supervisors with a conflicting interest may not participate in the deliberation and decision-making and that directors and supervisors who perform their duties improperly may be liable for the resulting damage. Furthermore, the grounds for dismissal of poorly functioning directors and supervisors are extended and now also apply to members of the supervisory body. Finally, the proposal entails a legal basis for all kinds of entities to establish a supervisory board. It will now also be possible for all legal entities to opt for a board with both executive and non-executive directors and within which the non-executive directors fulfil the supervisory role. The Corporate Governance Code 2016 entered into effect on 1 January 2017, replacing the first Corporate Governance Code of 2008. The Code of 2016 is applicable to Dutch listed companies whereby the 'comply or explain' principle is leading and directors must report on this in the annual accounts. Non-listed companies can opt to follow the Code. The most important difference from the Code of 2008 is that long-term value creation is now central. In this respect, the board has to formulate a strategy relating to the creation of long-term value and thereby has to weigh the interests of all stakeholders. In line with this, the concept of 'culture' is introduced as a component of effective corporate governance. Management board members and supervisory board members are required to create a culture within the organisation that is focused on long-term value creation. In that context, values that fit into the views of the company and a code of conduct have to be formulated. As with the Code of 2008, the Corporate Governance Monitoring Committee will report annually on compliance with the Code. The Dutch M&A market has shown an increase in hostile takeover activity, recent examples being the bids for AkzoNobel and Unilever. This has led to a public debate on the use of response measures in the Netherlands. Following this, the Minister of Economic Affairs stated that he is in favour of additional legislation that would give directors more time and opportunity to assess the effects of public takeovers on all stakeholders. In June 2017, the House of Parliament discussed the effectiveness of the measures that management and supervisory boards of Dutch listed companies have at their disposal to respond to bids and takeover activities. Following this the government stated that it values an open attitude towards takeovers given their importance to the Dutch business and investment climate. However, the government also recognises that takeovers may pose risks to the economy, in particular if they are hostile. A legislative proposal is now being prepared on a preventive test in respect of takeovers of companies that belong to vital infrastructure sectors that are of major importance for national security, the economy or employment. Directive (EU) 2017/828 (amending Directive 2007/36/EC), regarding the encouragement of long-term and transparent engagement by shareholders of listed companies, must be converted into national law by the Member States by 9 June 2019. The Directive contains requirements relating to the remuneration of directors, the identification of shareholders, the facilitation of shareholders' rights, the transmission of information, transparency for institutional investors, asset managers and proxy advisers and related party transactions. The draft proposal act implementing the Directive in the Netherlands was published for consultation on 27 February 2018. The Joint Committee Company Law of the Dutch Bar Association and the Royal Dutch Notarial Association advised the Ministry of Justice and Security not to extend the provisions of the Directive with additional national rules when there is no specific ground for it. According to those entities, the focus should be on ways to strengthen the business climate in the Netherlands and to guarantee the flexibility of Dutch companies. Despite the financial crisis, foreign involvement has been present in the Dutch M&A market for a long time. Although not an immediate success, there were numerous efforts by foreign companies to take over Dutch businesses during the first months of 2017. Striking examples are the Belgian postal service Bpost wanting to acquire PostNL and PPG Industries' potential hostile takeover of AkzoNobel. Also Warren Buffett's Berkshire Hathaway, Kraft Heinz and 3G's attempt to make a deal with Unilever did not yield any result but nevertheless shows that the Dutch market is still very interesting for foreign investors. The majority of the M&A deals in 2017 were in-bound investment by foreign private equity investors or corporates. However, in some cases, the buyer dropped out, as in the sale of Attero, a Dutch waste treatment company. About three years ago, Dutch private equity investor Waterland bought Attero, which at the time was in the hands of six provinces and 116 municipalities in the south, east and north of the Netherlands, for a purchase price of €170 million. It appears to have been a good deal as, only a year later, Waterland received a €183 million dividend and, in 2017, allegedly another €50 million was added to that amount. In spite of the large cash-outs, Chinese parties seemed willing to pay sums of up to €1 billion for the company last year. In the end, there was no deal because, allegedly, the Chinese government suddenly set stricter requirements for acquisitions abroad. In the first quarter of 2018, Attero was finally sold to UK-based investor 3i and the German asset management company DWS, which is a branch of Deutsche Bank. Also in that first quarter, the chemical branch of AkzoNobel was finally sold for €10.1 billion to the American investment company Carlyle and the Singaporean investment company GIC. This combination won the bidding battle against three other parties, including the Dutch HAL Investments. Another public bid that has been stirring up feelings since 2016 is the one by Qualcomm Inc for the Dutch chip manufacturer NXP Semiconductors NV. Although in October 2016, the parties agreed on a price of US$110 per share (thereby setting a total value for NXP of €43 billion), Qualcomm fell prey to Singapore-based company Broadcom soon afterwards. Fearing that Qualcomm would pay too much for NXP, Broadcom got involved in the negotiations between Qualcomm and NXP. President Trump settled this in part by announcing that the acquisition of Qualcomm by a foreign party was off the table. In March 2018, Qualcomm announced it was extending the period of its cash tender offer pursuant to the purchase agreement of October 2016. However, the acquisition of all shares in NXP might still a long way off as US hedge fund Elliott, which holds around 7 per cent of the shares, has apparently stated that it wants at least US$135 per share. The number of high-profile potential public takeover bids in 2017 has been matched by an increase in shareholder activity. One of the most striking examples was the Dutch paint and coatings company AkzoNobel rejecting three unsolicited buyout offers by its US competitor, PPG Industries. Second, shareholder Elliott tried to dismiss the supervisory board member who, in their opinion, was responsible for AkzoNobel not engaging in talks with PPG. According to the board and the supervisory board, the offers by PPG undervalued the AkzoNobel business, contained significant risks and uncertainties, made no substantive commitments to stakeholders and demonstrated a lack of cultural understanding. Although AkzoNobel managed to keep its assailant at a distance, this made shareholder Elliott angry. When the board did not consent to the shareholder request to put the dismissal on the agenda of the next shareholders' meeting, a judicial investigation and immediate measures at the Dutch Enterprise Chamber were requested. However, the Enterprise Chamber rejected the request because, in its view, the dismissal was only intended to make sure that negotiations with PPG would start and, under Dutch law, there is no obligation for (supervisory) board members to do so because in the Netherlands a company's strategy is set by the management board (under the supervision of the supervisory board) and there is no obligation to discuss this with the shareholders beforehand. Other M&A trends can be found in the tech sector, in which Dutch companies continue to attract the interest of international companies. For the most part, larger corporates acquire tech start-ups to speed up technological development and keep up with market demands. A notable transaction was the acquisition in July 2017 of Dutch company Liteq by Kulicke and Soffa, the Singaporean market leader in the field of semiconductor packaging, to make use of the technology used by Liteq to create cheaper and more sophisticated packaging. A striking difference between 2016 and 2017 is that in 2016, Dutch companies were mostly buying foreign companies, whereas in 2017 Dutch companies were mostly being bought. The only real example of a Dutch acquisition in 2017 by a Dutch company was the acquisition of Autonomos by TomTom. Cash has remained the preferred means of funding M&A deals. Private equity and venture capital funding are runners-up as sources of funding for most transactions. Bank loans are also attractive in view of the low interest rates. A relatively new form of funding is initial coin offerings whereby start-ups using blockchain technology are raising capital through coin offerings. The Dutch regulatory authorities are watching these developments closely as it may trigger money laundering and fraud. With the introduction of the Work and Security Act in July 2015, employment law has been amended substantially. The Act regulates most aspects, such as entering into an employment agreement, employment conditions, payment of salary during illness, and termination of employment agreements. Under the Act, an employer can only terminate an employment contract on a limited number of grounds. In the event of the long-term illness of an employee or if an employer can demonstrate sufficient economical reasons, the Employee Insurance Agency will grant permission for an employer to terminate a contract. If the grounds are more personal (such as inadequate performance or a damaged working relationship), permission to terminate an employment agreement must be obtained from the courts. In all cases (except for a serious imputable act by the employee and summary dismissal), an employee who has been in post for more than 24 months is entitled to a statutory severance payment ('transition fee'). The sequence system for successive fixed-term employment contracts has been amended under the Work and Security Act. The number of successive fixed-term contracts has been limited to three, and the total period may not exceed two years. In the event of a fourth consecutive contract or if the total duration of employment exceeds two years, the employment contract will be deemed permanent. Elections for the Dutch Lower House of Parliament were held in March 2017; it took the resulting coalition until October 2017 to come to an agreement. The parties in the government proposed important measures for the labour market, which were detailed in the Balanced Labour Market Bill. On 9 April 2018, the Bill was presented for internet consultation. The projected date of entry into force is 1 January 2020. A new ground for dismissal is proposed, in addition to the existing limited grounds for dismissal: the 'cumulation ground'. This ground offers employers the option to combine several incomplete grounds for dismissal into one successful ground. Currently that combination of grounds is not possible. An employer who requests termination of an employment agreement must choose between all limited grounds. In the case of cumulation of grounds, the court may award an employee an extra fee on top of the transition fee (and fair compensation, if any). Employees will be entitled to a transition fee from the first day of their employment agreement (including the probationary period), not only after they have been employed for more than 24 months. The current sequence system of a maximum of three contracts in two years will be extended to a maximum of three contracts in three years. The current rule that the sequence is interrupted after a period of more than six months will remain unchanged. In 2017, preliminary questions of the Subdistrict Court of Almere were answered by the European Court of Justice (ECJ). The ECJ has ruled that a pre-pack (short for pre-packaged insolvency) is not excluded from European Directive 2001/23 on the transfer of undertakings (the Directive). Based on the Directive – and the implementation thereof in the Dutch Civil Code – the employees of a transferring undertaking remain entitled to their employment and all rights and obligations from that employment. In this event, the acquiring undertaking must also take over these employees. If an undertaking is declared bankrupt, its employees are not protected by the Directive or the Civil Code. For this reason, the pre-pack was created as a means of preventing (additional) loss of value as in a regular bankruptcy and to increase the chance of relaunching the company. A pre-pack is a transfer of the assets prepared before the declaration of bankruptcy with the consent of a prospective insolvency administrator, appointed by the court, and is put into effect by that administrator immediately after the declaration of bankruptcy. The ECJ has ruled that the Dutch pre-pack procedure does not qualify as 'bankruptcy proceedings' within the meaning of the Directive because its purpose is for the continuation of the company, not its liquidation. Therefore it is not justified that employees lose the protection of the Directive. The consequence is a basic rule whereby all employees will automatically transfer to the acquiring company, while retaining the employment conditions from the bankrupt company. The new coalition government has concluded that the intended (and postponed) introduction of the Assessment of Employment Relationships Deregulation Act (the DBA Law) should be cancelled. Instead, the coalition agreement contains alternatives for the position of self-employed workers. It is often the subject of dispute whether a self-employed person is in fact employed by a contracting party. In the Balanced Labour Market Bill, the coalition proposes an alternative to the model agreements the Dutch Tax Authority is currently approving. The use of these approved models reduces the risk of meeting the requirements of an employment relationship with all its obligations (such as taxes, but also protection under Dutch dismissal law). The proposed alternative contains, for example, a minimum rate for independent contractors and the introduction of a declaration of commissioning. Those elements contribute to security and clarity for independent contractors about their position. companies that are required by the Dutch Civil Code to publish an annual report are obliged to include figures on the remuneration ratio between men and women, an explanation for the possible difference in pay between men and women and of the policy they are pursuing to promote equal pay. Although the proposal was received positively, it is unclear whether it will be adopted in this form as, during the first plenary session at the House of Representatives, there was criticism about it. The proposed legislation is still being debated in the House of Representatives. The public debate on corporate tax planning has continued and, on 7 June 2017, the Multilateral Instrument (MLI) that was proposed following the OECD's Base Erosion Profit Shifting (BEPS) Action 15 was signed by more than 70 countries, including the Netherlands. Pursuant to the MLI, BEPS Actions – such as agreed minimum standards to counter treaty abuse –- can be implemented in bilateral tax treaties without countries having to renegotiate and amend all such treaties. One of the measures of the MLI is the introduction of a 'principle purpose test' (PPT), pursuant to which a treaty benefit may be denied if obtaining that treaty benefit was one of the principal purposes of any arrangement or transaction that resulted directly or indirectly in that benefit, unless it is established that granting the benefit in the relevant circumstances would be in accordance with the object and purpose of the relevant treaty. Considering that the PPT is an agreed minimum standard against 'treaty shopping', and that all countries that signed the MLI have opted for at least the implementation of the PPT, it is likely that this anti-abuse rule will be implemented in many of the Netherlands' bilateral tax treaties. In abusive situations, it will then become much easier for the Netherlands to deny treaty benefits to foreign recipients of Dutch source income. A recent change in tax regulation has had an immediate effect on the structure of M&A transactions. The Act regarding the dividend withholding tax obligation for holding cooperatives and the expansion of the dividend withholding tax exemption came into effect on 1 January 2018. Under previous Dutch law, a cooperative was not subject to dividend withholding tax, unlike a private limited liability company (BV) and a public limited liability company (NV). In the light of the increasing importance of cooperatives in international structures (as a possible means for international tax evasion) and the state aid risk, a dividend withholding tax obligation for qualifying membership rights in holding cooperatives was introduced. A holding cooperative is defined as a cooperative whose actual activity in the year preceding the distribution consisted primarily (i.e., for 70 per cent or more) of the holding of participations or the direct or indirect financing of affiliated entities or natural persons. A qualifying membership right of a holding cooperative is defined as a right that entitles the holder to at least 5 per cent of the annual profit or at least 5 per cent of what is paid out on liquidation. Furthermore, under the new Act, the dividend withholding tax exemption is extended from distributions made to qualifying BV and NV shareholders within the European Union and EEA to distributions made to qualifying BV and NV shareholders and qualifying holding cooperative members located in the European Union, the EEA or in a country with which the Netherlands has concluded a treaty that contains a tax provision for the prevention of double taxation. The exemption is subject to an anti-abuse rule. Although the dividend withholding tax will be abolished altogether in 2020, the government expressly chose to introduce the Act because of the state aid risk and the fact that it can serve as a basis for new legislation. Under current law, the Netherlands does not levy a withholding tax on interest. However, the government recently announced plans to introduce a withholding tax on interest in abusive situations as from 1 January 2021, to avoid the Netherlands being used for payments to low tax jurisdictions through Dutch conduit entities. No details of this new withholding tax are yet known. In principle, a Dutch company engaged in financing activities will be taxed on the difference between the interest income and expenses (spread). For intra-group financing companies there are minimum equity and minimum substance requirements that should be reviewed and discussed in more detail. On 26 October 2017, the General Court of the European Union annulled the European Commission's decision dated 10 October 2014 whereby it approved the merger between the Dutch cable companies UPC and Ziggo (following the acquisition of Ziggo by Liberty Global, the US parent company of UPC). The companies' Dutch competitor, KPN, disagreed with the decision and brought an appeal at the General Court. According to the Court, the Commission had failed to explain why the merger would not have raised vertical competition concerns in relation to premium pay TV sports channels and thus annulled its decision. It is unclear what the exact consequences of the annulment will be. In accordance with the EU Merger Regulation, the concentration6 will have to be re-examined by the Commission or the Commission can appeal to the ECJ. A complicating factor is that the merged UPC/Ziggo entity has already been combined with the Dutch business of UK telecom company Vodafone into a 50/50 joint venture, which was approved by the Commission. Furthermore, on 18 January 2018, after an in-depth review, the European Commission approved under the EU Merger Regulation the proposed acquisition of the Dutch company NXP by the US company Qualcomm. Since the Commission had several concerns about competition (the firms are both important players in the semiconductor industry), the approval is conditional on full compliance with the commitments offered by Qualcomm (remedies regarding licences and interoperability). The public bid had been made in 2016, but it took some time to fulfil the conditions precedent, most notably the approval of the regulatory authorities in several countries. At the moment, this precedent is still only partly fulfilled. Furthermore, not all shareholders have agreed with the price that was offered. At the request of the Ministry of Commerce in China, Qualcomm and NXP have withdrawn and refiled the notice of acquisition to obtain approval of the Chinese government. In that light, the end date for the purchase agreement was extended (for the last time) from 25 April 2018 to 25 July 2018. The year 2018 started strongly, with the highest level of M&A activity in the past 10 years, especially in the mid-market. We expect technology will continue to be a key driver in M&A transactions for the rest of the year, as it is in the rest of the world. With a positive outlook for the world economy, a stable oil price, strong company balance sheets and piles of dry powder, we expect 2018 to be a booming year for M&A in the Netherlands in terms of the number of transactions. 1 Meltem Koning-Gungormez is a partner and Hanne van 't Klooster is an associate at Kennedy Van der Laan NV. 4 Supreme Court, 13 March 1981 (Haviltex). 5 Supreme Court 5 April 2013 (Lundiform/Mexx). 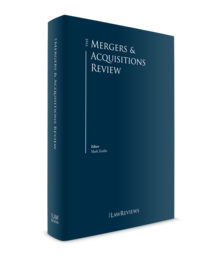 6 The term 'concentration' used in the EU Merger Regulation covers various types of transactions, such as mergers, acquisitions, takeovers and certain types of joint ventures. In this eighth edition, we can see that corporate governance is becoming a more vital and all-encompassing topic with each year that passes. We all realise that the modern corporation is one of the most ingenious concepts ever devised. Our lives are dominated by corporations. We eat and breathe through them, we travel with them, we are entertained by them, most of us work for them.